The Good: I’ve made a habit of applying this balm to my feet every night before going to bed, giving my feet pre-sleepytime moisturizing attention like I do with my hands. I’ll rub the open tin directly onto my heels and the balls of my feet. I’ll also rub it onto the tops of my toes. Then I’ll rub my feet together in my best cricket imitation to really get the balm deep into my skin. 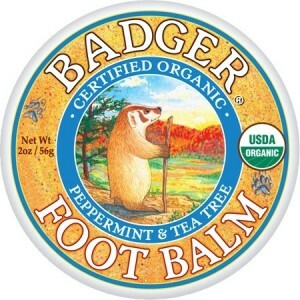 You can definitely smell the peppermint in this foot balm, but I think it has more a fresh, almost citrus overtone to it. I like how despite being made of lots of good oils for your skin, like extra virgin olive and jojoba oils, it doesn’t make your feet feel greasy. The balm really absorbs into your skin. And at $5.99 for the 0.75 oz tin, it’s an affordable buy. The Questionable: There’s only one thing I don’t like about this product, and that’s how hard it can be to open the tin. Once a little balm gets on the sides of the tin, it can be difficult to remove the lid. When you keep your nails polished like I do, you don’t really want to pry tins open with the tips of your nails. It would be awesome if they could make this tin like old school shoe polish tins with the little twisty lever thingamajig. The Verdict: No one likes ashy toes, and this is the perfect product to keep your piggies looking pretty in your strappy sandals all summer long. Just last week I was in Las Vegas where I did tons of walking in sandals on concrete. 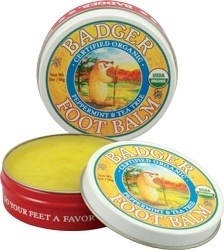 At the end of the night, the first thing I would do when I got into my hotel room was to remove my shoes, wash my feet and then liberally apply this Badger Foot Balm. Worked like a charm and my feet never looked worse for the wear. Highly recommend. Just say “no” to ashy toes!